Recipe courtesy of Cakeman Raven via Food Network. Preheat oven to 350 degrees and lightly spray muffin pans with non-stick spray. Then place cupcake cups into each muffin tin. In a large bowl, sift together the flour, sugar, baking soda, salt and cocoa powder. In another bowl, whisk together the vegetable oil, buttermilk, eggs, food coloring, vinegar and vanilla. Using a stand mixer, slowly mix the dry ingredients into the wet ingredients until just combined and the batter is smooth. Ladle the batter into the cups, filling each cup about 3/4 full. Bake for approximately 18-20 minutes for large cupcakes and 8-10 minutes for mini cupcakes, or when an inserted toothpick comes out clean. Let cool completely before frosting. Recipe makes 24 large cupcakes and 24 mini cupcakes. In a stand-mixer with the paddle attachment or a hand-held electric mixer in a large bowl, mix the cream cheese, sugar and butter on low speed until incorporated. Increase the speed to high, and mix until light and fluffy (about 5 minutes). Occasionally scrape the sides with a spatula. Reduce the mixer speed to low. Add the vanilla, increase the mixer speed to high and mix briefly until light and fluffy. Store the frosting in the refrigerator until somewhat stiff before using. A quick, easy way of frosting is to put several spoonfuls into a Ziploc baggie and snip a small bit of a corner off to make a simple pastry frosting bag. Frost in the pattern desired. Recipe makes enough frosting for 24 large cupcakes and 24 mini cupcakes. These cupcakes are Mr. swatchcat and Meggie-poo approved! 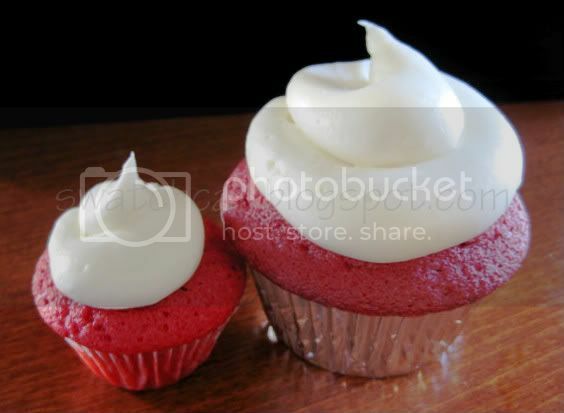 Those cupcakes look so scumptuous!! 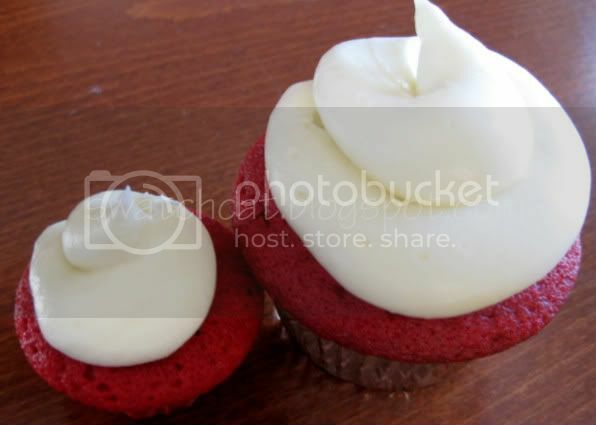 :) I am slightly embarassed to say I've never had red velvet cupcakes....but your pictures look fantastic! I will try making these!! Yesterday,I had to use up bananas that were super ripe, so I made a batch of banana cake and chocolate banana cake, but baked them as cupcakes yesterday. So moist and delicious, but I think they are missing something....I plan to frost them in peanut butter icing! Ooh, those sound delicious, Hannah! Mmmm, chocolate and banana! I think they are missing something....I plan to frost them in peanut butter icing!